Light: Making objective decisions. Applying logic. Reasoning your way out of a difficult situation. Solving puzzles. Thinking things through. Emphasizing the facts. Clearing your mind. Seeking clarity. Shadow: Applying ruthless or twisted logic. Gloating over your own superior intellect. Using quick thinking to deceive or confuse others. Confusing snap judgments with quick thinking. Making decisions without thinking through consequences. Story: The Main Character must make an important decision that will determine his or her ultimate fate. Relationships. Set your emotions aside for the moment and look at your relationship from an objective point of view. Would a judge or jury say this relationship is performing as it should? You’re facing a difficult decision; make it with your head, not your heart. Work. Cut through emotionalism and get to the facts. In this situation, the devil’s in the details. What happened and when? Slay some sacred cows, stop the blame game, and get down to brass tacks. What are the objectives? Where are you in relationship to your goals? Spirituality. Your relationship with Spirit should inform all your decisions. Here’s an opportunity to apply what you’ve learned in your inner life to decisions that impact your outer life. If you were to make this decision for someone else, what verdict would you render? Personal Growth. At some point, we must go from seeking advice to making our own decisions. Gather information, draw on the experience of mentors, and get the facts…but be prepared, as a mature individual, to make decisions and own the consequences. Fortune Telling. The time to make a choice is now. Stop wavering and do what you know is best. The Festooned Crown. The Tarot of Marseilles and RWS-inspired decks picture the Sword topped by a festooned crown. If this decision were made by your Higher Self, freed from petty, earthly concerns, what verdict would be rendered? Swords as Symbols. 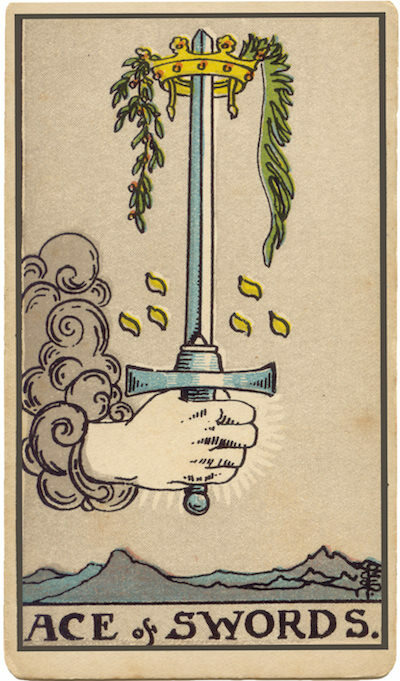 As a suit marker, Swords suggest logic, clarity, and decision-making. Remember the story of wise King Solomon, who once offered to slice a baby in half in order to resolve a dispute over motherhood? Swords cut through confusion, revealing our agendas in the process. The Nature of the Ace. Compressed into the Ace are all the qualities of all the other cards of the suit. In this way, the Ace can be said to be the “root” or “seed” of its associated element. How might your situation contain the seeds of intellectual or logical growth? Your First Impressions. When you see the Ace, what’s your first impression? Is the Sword being offered as a gift…or wielded as a weapon? Does it point upward, to God, or downward, to Earth? Is it to heavy to bear, or something you could manage? If I made my decision purely based on reason and logic, what would my decision be? What do I think about my own problem-solving ability? Who can supply me with the pure and simple facts?